Here's one more video of the live event recap with some takeaways from the speakers. 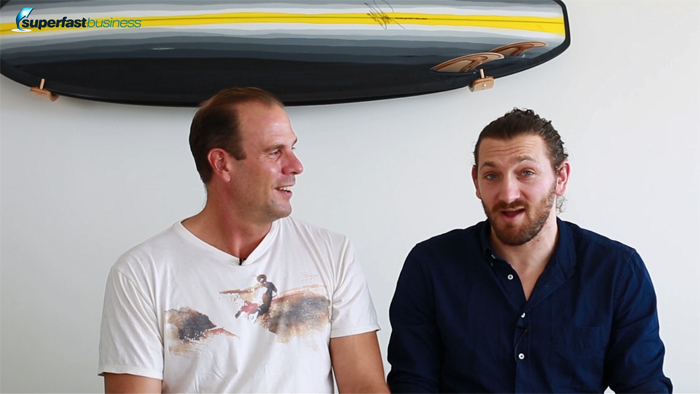 Tune in as James and Ezra talk social media, customer qualification, copywriting and more. 06:58 – Want to hang out? James: So welcome back to this series. If you haven’t heard the beginning of this series, please go back and listen to the first episode. Ezra: What we’ve been doing is just going over the experience of being at SuperFastBusiness 11, kind of what happened, what each speaker talked about, a little bit of a recap. Ezra: When is that one? James: It’s on March 16 and 17th. James: Yeah, March. Then you’ll get a feel for what it’s like. All the videos are being loaded inside SuperFastBusiness membership, you can watch every one of them, they’re amazing, they’re fully transcribed, and you get the audio version as well. They’re all being uploaded over the next few weeks. So, Matthew Kimberley talked about booking yourself solid. Ezra: I thought he was great, man, I thought he really presented well. James: I think it’s good to be comfortable. Ezra: It’s to be deliberate. Ezra: You know, you’re not a suit guy. Ezra: You’re not a suit guy. James: I’ve worn enough suits. Basically, most people who like wearing suits a lot now never had a proper job. And so it’s exciting. Ezra: I scooped ice cream for a while. James: …through to like, 8 years ago. Ezra: I was never forced to wear a suit. James: No. I was forced to wear suits for decades, so I’ve had my suits. Ezra: We ought to try: Audience, give us a comment if you want to see James in a suit, at like some point. I’d like to be on that show. James: I posted a picture of me wearing a suit and a tie. Ezra: It’s different than us actually getting you in a suit. I’d like to hear what people think about getting you in a suit. So I liked his red velvet rope policy. Just don’t let anyone into your program, they have to qualify. He also talked about a product carousel, instead of the ascension model. You don’t have to force someone to go back and opt in to a course, do your e-book and then buy the next course and then get your highest one. Come straight to the top. Ezra: Have a circle of offers. James: You want to get to the top, go there right now. And then he shared a simple selling formula, which you can watch in the video. After that, we heard from John Logar, and he really focused a lot on mindset, because he helps people get high-level deals. Ezra: He sells high-ticket stuff, right? James: And most people’s mindsets stop them from doing that. Ezra: Absolutely. A lot of people have a hard time raising their prices, selling higher ticket offerings, being a premium service offering. James: And you get what you focus on. Ezra: Yeah. I remember when I was in the services business several, several, several years ago. I remember that jump from selling to small businesses to selling to big businesses. James: And he talked about looking where expos are, and how you can get a lot of leads at once. I went to an expo yesterday, and I got a sample from every single vendor, and when I look at their marketing, it’s rubbish. Their websites are terrible, some of them had amazing scripts, most of them were terrible, and the best ones stood out. So it would be really easy to get up to speed in your market by going to an expo and working it. Ezra: Speak the lingo of your community. James: Nine-word email. So it’s like, “Hey, Ezra, I’ve been helping e-commerce businesses get an extra 200 percent profit, and right now I’m looking for some partners to work with. If you’re interested, just reply back and say yes.” Would you reply to that? Ezra: Yeah, I’d say “Yes”. I get like 10 solicitation emails a day. And I delete them all, because they’re terrible. Ezra: That one I would respond to. So anyway, he shared that, that’s awesome. After him, we heard from Jen Sheahan, and she talked about social media and how it is now more of an integrated symphony, I know I liked that metaphor. But she just pointed out, a lot of people put out crappy content. Ezra: Or they posted only once. James: Yeah. So she said stagger it, put it in different places, targeting the different types of audiences. She gave an example of that, and also she tells how to do it for Facebook, how to do it for Twitter, how to do it for LinkedIn, and how to actually produce quality content and put it on YouTube and Instagram. Ezra: Sort of the content syndication master plan. James: Yeah. And make it last longer. And then she gave us a Snapchat demo, which was good. James: Then we heard from our good friend Ed Dale, and he was talking about what it was like working with Gary Halbert. And he said you got to know your customers’ pains, and their gains. If you can’t, you shouldn’t be selling it. And just sell one thing at a time, it’s like doing one thing at a time. Write to a timer, because all creative processes have deadlines. Ezra: There was that quote that was, something creates… what was the, it was a soundbite there. I wrote it down, I can’t remember it, but it was, constraint creates creation, or something. James: Right. So put constraints on it. Do your vomit draft, like the first version. Stop comparing your first effort with other people’s last effort. And use templates. Heard that before. And all the magic happens in the editing. Alright? Like this video. Before this edit, it was horrible. But now, it’s amazing, right? Ezra: It wasn’t that bad. James: And have multiple front doors. He thinks that’s the most exciting thing about the internet now, which is what OTR is, or Own The Racecourse. Every single blog post is a front door. Ezra: There are a lot of ways to get access to you. James: Yeah. And make sure your content works on a mobile, because that’s where it’s going. So we sort of closed out with Andrew Lock. He really blended into Australia. Ezra: He showed up in a hat with koalas on. James: Boomerang, Australian flag, he put in the effort. He stole the show, he was the most popular speaker. He shared some of his favorite restaurants, I think Herpes Pizza was one of them. Ezra: He was engaging, he was fun, he was relevant, and he was talking about sort of onboarding, like when you sell something, make sure people have a wow experience, but then also continue that, right? Don’t just sell it and be done. James: Well, he basically helped us to learn how to keep members. We want to retain, not detain. And he said he loves membership sites for 12 reasons: January, February, March, April… But if you convey a clear message, you give members a quick win. You give them great tools to talk to their spouse and justify the purchase. Ezra: You future pace, and talk about what’s coming up. James: Yeah. Encourage people to get engaged quickly, like upload a picture, let them know what to expect, give them lots of recognition and rewards, don’t overwhelm them, so he’s on the same page as me with that. And connect with your members, like these live meetups. And he actually said hosting a live event is one of the best things ever. Ezra: Bringing your community together. James: On that note, if you’d like to hang out with me and some experts and the community at the next event, then grab a ticket when they go on sale, because they sell out before the event comes. We’ve sold out every single year prior to the event. Ezra: SuperFastBusiness 12 will be in Manly, in March of 2017, so hope to see you there. James: Yeah. And if you want to see some of the highlights from the event, have a look on social media for #sfblive, and you’ll see the trail of destruction or production we left from the event. Yes me! I’d like to see you in a suit James :-) I’m positive you’d look great in the right one. But you know what? – It’s not the suit itself you dislike, it’s the negative association you have with the suit. Clearly, even the thought of wearing one triggers negative emotions in you… It reminds you of unhappy times. Break the negative association and you’ll be fine. On a different note, I enjoyed this last video. Not sure Ezra’s microphone was working properly though ‘cos your voice definitely came across louder. Thanks for the Mic note – we are checking. I don’t have a negative association with the suit, When I dressed up in them I felt smart and they looked good. I don’t currently have a relevant platform to where one. I surf and wear boardshorts or a wetsuit. At home I’m not going to kick around in a suit like Alfred in Batman. I don’t need to wear one from stage because my audience are not wearing suits. It just does not fit the occasion is my point. Ezra is having fun wearing his suit – he didn’t have time in a corporate job to get to know a suit and experience the magnificence of dressing up. I’ll still wear a suit to a wedding though. Right occasion. ^^ YES. In fact your outfit at the event was massively attention getting and broke all moulds. Genius. I meant as a one-off – not permanent image change.